The Giants just don’t have to worry about the 49ers’ fearsome defense and a hostile San Francisco crowd, the rain and wind may conspire against the Giants’ hot passing game. To help them weather the elements, here are five ways to keep their playoff run going all the way to Indianapolis. 1. 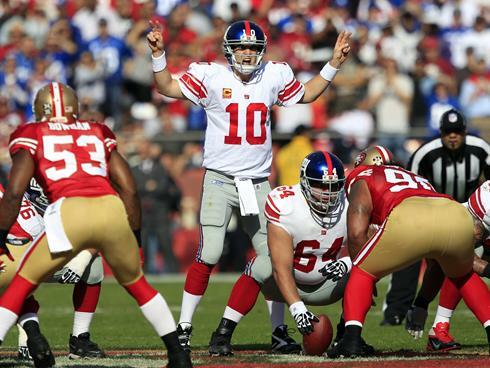 Break them – The 49ers have the uncanny ability to stop opponents in the middle of long drives. They bend but don’t break. It’s great to drive the ball 55 yards for a field goal, but the Giants can’t let San Fran break their momentum when things are moving. Those extra four points can go a long way to win the game or get a little breathing room and put more pressure on the 49ers’ offense. Converting on third and fourth downs in San Francisco territory is going to be paramount to the Giants’ success. 2. Hold onto the ball – The Saints had five turnovers in their loss to the Niners last week. That probably won’t happen again but San Fran hits hard so it’s important that everybody that carries the ball protects it, even at the expense of a few extra yards. The 49ers’ secondary also does a good job of disguising itself. Eli threw two INT’s in WEEK 10. He has to be more careful this time. With sloppy conditions, the game has the potential to be a low-scoring affair and a defensive score could be the difference. If this turns into a field-position battle, you don’t want to give the other team the opportunity for any easy touchdowns. 3. Don’t forget Gore – The Hydra put pressure on Aaron Rodgers all game last week. Getting in Alex Smith’s face is going to be key to beating the 49ers and trying to force turnovers. However, the defensive line has to remember about Frank Gore. They did a fantastic job against a star runner in Michael Turner in the Wild Card Round and kept Gore under wraps earlier in the season. That has to continue, especially since it’s going to be hard to throw the ball. Sometimes when Giants’ pass rush is at its finest, they over-pursue and let runners pick up big chunks of yards. Taking away the passing game means nothing if Gore is allowed to run amok. Kendall Hunter is dangerous too. He averaged more than six yards per carry when these teams met before. 4. Be patient – This is the best defense the Giants have faced in a while. The offense has been playing great but if the weather and the Niners have the unit stuck in mud (literally and figuratively), the Giants can’t abandon a mixed pass/run gameplan or take unnecessary risks. With the big play potential of Nicks and Cruz, as well as the punishing running of Bradshaw and Jacobs, the Giants should eventually break through. Like the Falcons game, if the Giants are facing a deficit and their offense is stagnant, good things will eventually come if they remain consistent. 5. Talk is cheap, play the game – It’s Coach Coughlin’s mantra and words to live by. The Giants are confident and playing great but none of that matters if they don’t take care of business on the field. They don’t appear overconfident but it’s always a possibility when you beat the best team in the league and everyone is picking you to make the Super Bowl. The 49ers are for real. They beat some good teams this year and have the ability to beat the Giants again. The teams both did a little talking over the week that was exaggerated by the media, but for sure this game is going to be decided between the lines. Everything that happened in the past is just that. You can’t be distracted by words or the weather. You have to go out there and do it.